On Saturday, the #25 Georgia Bulldogs (6-3, 4-2 SEC) travel to face the #7 Auburn Tigers (9-1, 5-1 SEC). The game will be televised by CBS at 3:30pm ET. Georgia will be playing at Auburn for the second consecutive season for the first time ever. The schedule quirk was reportedly made in order to balance the SEC’s future scheduling format. A win over Auburn would keep the Bulldogs in the SEC Eastern Division title race. However, Georgia needs Missouri to lose two conference games in order to secure their third straight division crown and championship game appearance. 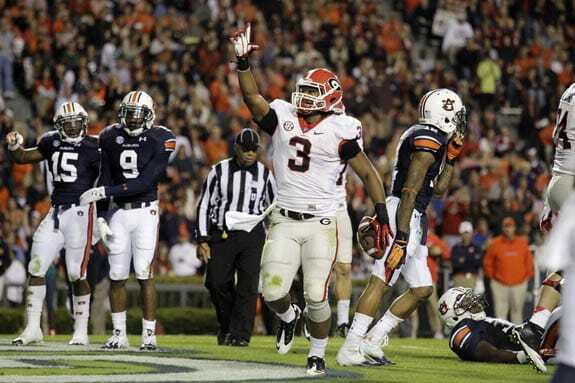 Georgia has dominated Auburn lately, winning 45-7 in Athens in 2011 and 38-0 on the plains last season. That’s a combined score of 83-7 over the past two years. The Dawgs have also won six of the past seven meetings and have evened “The Deep South’s Oldest Rivalry” at 54-54-8. But the 2013 Auburn Tigers are a slightly different breed. They are now led by head coach Gus Malzahn, who was the offensive coordinator under Gene Chizik from 2009-11. Auburn’s quarterback is Nick Marshall, a former Georgia Bulldog who played cornerback in all 13 games during the 2011 season. Marshall was dismissed from the team after allegedly stealing money from his teammates. Marshall has led Auburn to a number 14 ranking in total offense with 493.3 yards per game. The Tigers are ranked 3rd in rushing with 320 yards per game. This plays into the current strength of the Georgia defense which is stopping the run. 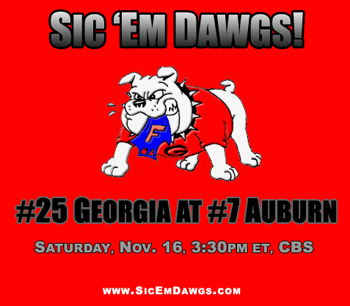 The Dawgs hope to contain Auburn’s ground game and make Nick Marshall beat them through the air. Passing is something Auburn didn’t have to do much of in their last two wins. Marshall attempted only eight passes against Arkansas and seven against Tennessee. On offense, Aaron Murray has a few of his weapons back in Todd Gurley, Michael Bennett, and likely Chris Conley. Georgia should be able to score on Auburn, which is ranked 66th nationally in total defense but has improved over the past few weeks. Georgia is 54-54-8 against Auburn. Mark Richt is 8-4 against Auburn. Georgia is ranked 22nd in Total Offense with 478.6 yards per game. Auburn is 14th (493.3 yards per game). Georgia is ranked 30th (tie) in Scoring Offense with 35.6 points per game. Auburn is 17th (38.6 points per game). Georgia is ranked 32nd in Total Defense with 367.0 yards per game. Auburn is 66th (394.4 yards per game). Georgia is ranked 78th (tie) in Scoring Defense with 28.8 points per game. Auburn is 21st (20.4 points per game). Georgia is ranked 105th in Turnover Margin (-7 ratio). Auburn is 58th (+1 ratio). Georgia is ranked 75th (tie) in Fewest Penalties Per Game (6.11 per game). Auburn is 15th (4.4 per game).